Objective: The purpose of this study was to evaluate the anti-diabetic activity of ethanol extract of Tabernamontana divaricata (L.) and its ameliorative effect on oxidative stress in alloxan-induced diabetic rats. Materials and Methods: Diabetes was induced by single intraperitoneal injection of alloxan monohydrate (140 mg/kg body weight). 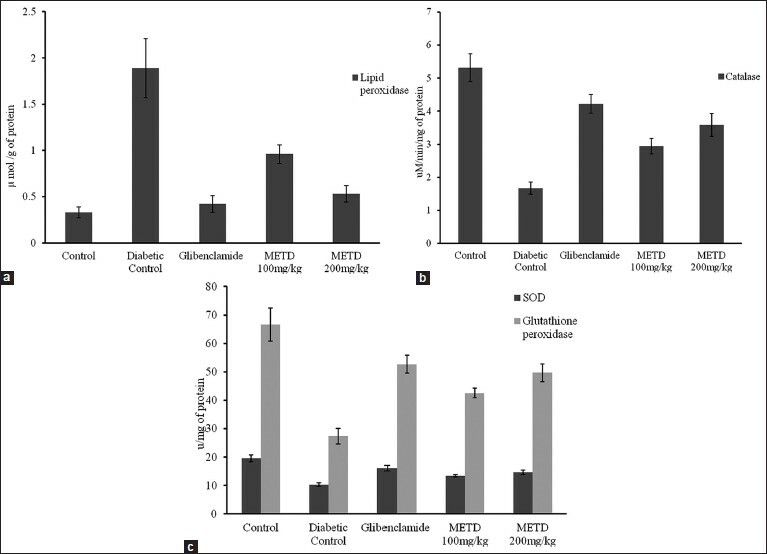 Methanol extract of T. divaricata was administered at the doses of 100 and 200 mg/kg body weight in diabetic induced rats including glibenclamide (3 mg/kg) as a reference drug. In the continuous 21 days treatment, fasting blood glucose level was determined on 0, 7, 14 and 21 days. On day 21, serum lipid profiles and glycosylated hemoglobin, liver antioxidant enzymes levels were estimated. Results: Experimental findings showed a significant anti-diabetic potential of the extract in terms of reduction in blood glucose levels and a correct effect on the altered biochemical parameters. Observed data were found statistically significant in correction of antioxidant enzyme level accompanied with diabetes, particularly at the dose of 200 mg/kg body weight. Conclusion: Based on the results, it can be concluded that the T. divaricata is found to be effective in type 2 diabetes in rats and to have an ameliorative effect on the associated oxidative stress. Diabetes mellitus is associated with high risk of atherosclerosis, renal, nervous system and ocular damage. Uncontrolled hyperglycemia appears to be the principal biochemical abnormality that underlies the increased oxidative load in DM. Increased oxidative stress may contribute to the pathogenesis of the diabetic complications. In addition, increased oxidative injury has been implicated in the premature age-related changes in DM. Multiple studies have shown that type 2 diabetes is accompanied by increased oxidative damage to all bio-molecules, especially lipids. Results of studies in animal models and in humans have demonstrated that diabetes is associated with oxidative stress, which is exhibited by elevated blood levels of lipid peroxidation (LPO) products (markers of oxidative stress), especially associated with poor blood glucose control. , High oxidative stress can lead to microvascular cerebral diseases, e.g., stroke, cerebral hemorrhage, and brain infarction. Tabernaemontana divaricata (syn. Ervatamia coronaria) commonly called as Crepe Jasmine is a glabrous evergreen dichotomously branched shrub mostly found in tropical regions. The plant grows up to a height of about 6-feet, bears attractive white colored sweet-scented flowers having five-petal pinwheels gathered in small clusters on the stem tips. The leaves are large, shiny, and deep green in color, and the size is about 6-inches in length and 2-inches wide. The flower juice is used in the treatment of eye infection. The root is acrid and bitter in taste; the milky juice mixed with oil is applied onto the head to cure pain in the eyes. Chewing of root relieves toothache and the root paste is applied to wounds to prevent inflammation. It has been used in Chinese, Ayurvedic and Thai traditional medicine for the treatment of fever, pain, and dysentery. , The purpose of this study was to carry out phytochemical evaluation and to investigate the anti-diabetic effect of aerial parts of T. divaricata and its prevention of oxidative stress in alloxan-induced diabetic rats. The plant was collected from the areas of Nagercoil and positively identified and authenticated by Prof. Mr. V. Sivanadanam, Department of Botany, Lekshmipuram College of Arts and Science, Neyyoor, Kanyakumari District, Tamil Nadu, India. The plant specimen was certified as T. divaricata of family Apocynaceae from available literature. The shade-dried powdered plant material was successfully extracted with methanol for 48 h at 55-65°C. The extract was filtered and concentrated by distillation and solvent was recovered. The final solution was evaporated to dryness at room temperature. Then the extract was stored in the desiccators and used for subsequent experiments. Healthy male Wistar albino rats, 2-3 months of age and approximately weighing between 150 and 250 g were used in the present study. Rats were housed in polypropylene cages and allowed free access to feed and tap water under strictly controlled pathogen-free conditions with room temperature 25 ± 2°C. All experiments were conducted in accordance with the internationally accepted principles for laboratory animal use and care. The diabetic rats were randomly divided into four groups of six animals each. The first group served as control, 1% carboxy methyl cellulose (CMC) 10 ml/kg, p.o. The second group was administered glibenclamide (3 mg/kg, p.o. ), while the third and fourth groups received METD at 100 and 200 mg/kg, p.o. All groups received glucose solution (1 g/kg) 30 min after the above treatments. Blood samples were collected from the tail vein just prior to and after 30, 60 and 90 min after glucose loading. Results achieved from glucose tolerance test were taken as a hypothetical reference to extrapolate the dose levels which will be used for evaluating short- and long-term effects of METD on diabetic rats. The animals were divided into five groups containing six rats each. Groups IV and V: Diabetes-induced animals were treated with METD 100 mg/kg and 200 mg/kg (p.o. ), respectively. Fasting blood glucose levels of all rats were determined before the start of the experiment. Blood samples were collected at weekly intervals from tail vein puncture till the end of the study. In the continuous 21 days of drug treatment, blood glucose levels of all animals were determined at the 0, 7, 14 and 21 days. On day 21, blood was collected by cardiac puncture under mild ether anesthesia from overnight fasted rats. The rats were sacrificed by decapitation and relevant organs such as liver and pancreas of all the animals were dissected out and stored at −20°C. All the results were expressed as mean ± standard error of the mean and were analyzed by analysis of variance and groups were compared by Tukey-Kramer multiple comparison test. Differences between groups were considered significant at P < 0.05 level. The pancreas was fixed in 10% formalin and embedded in paraffin wax. Sections were made using rotary microtome and hematoxylin-eosin was used as stain. Histological observations were made under light microscope. The phytochemical tests showed the presence of carbohydrates, proteins and amino acid, flavonoids, glycosides, saponins, steroids, phenols, triterpenoids and alkaloids. The test shows a negative report for tannins. An immediate increase in the blood glucose level was observed in the control group after the administration of glucose. In glibanclamide and METD (200 mg/kg) treated groups, a significant reduction (P < 0.001 and P < 0.01) in the glucose level was observed at a different time interval as compared to the control groups. The blood glucose in normal rats is not disturbed by both the doses of METD. Results have been shown in [Table 1]. The effects of METD at two dose levels (100 and 200 mg/kg, p.o.) and glibenclamide on blood glucose level in alloxan-induced diabetes have been shown in [Table 2]. Significant (P < 0.001) rise in blood glucose level shows the induction of diabetes by alloxan in diabetic control group. Administration of METD at 200 mg/kg dose level attenuated the increased level of glucose produced by alloxan at a different time as compared to that of glibenclamide. After the administration of alloxan, there was a significant (P < 0.001) increase in the serum TC, TG, and HbA1c levels [Table 3]. Treatment with METD at 200 mg/kg, elicits a significant decrease in the cholesterol, TG (P < 0.001) and HbA1c (P < 0.01) level when compared with nontreated groups. Altered insulin level was also corrected significantly (P < 0.001) by METD at 200 mg/kg. As shown in [Table 4] and [Figure 1]a-c, antioxidant enzyme levels such as lipid peroxidase, catalase, SOD and glutathione peroxidase were found to be altered in the diabetic control rats. Administration of METD at both the doses reversed the altered levels significantly (P < 0.01 and P < 0.001) in a dose-dependent manner. 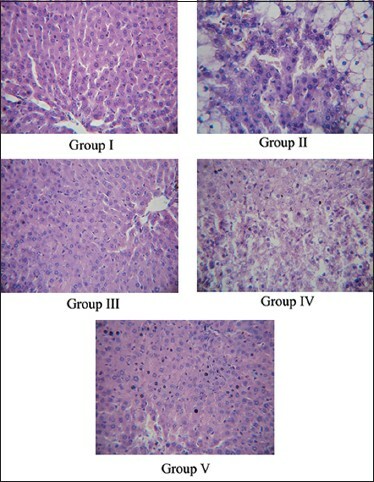 In histopathological studies, the pancreas sections of control rats showed a normal pancreatic architecture. Alloxan-induced diabetes of rats shows loss of the pancreatic architecture with destruction of beta cells in the pancreas. Preadministration of METD at the dose of 100 and 200 mg/kg for 21 days reduces the pancreatic injury and necrosis which clearly indicating the protective effect of the extract, whereas glibenclamide (3 mg/kg) treated rats showing a normal pancreatic architecture with moderate and mild degree of necrosis. Histological examination of the pancreas showed a protective effect of METD on alloxan-induced diabetes at the dose level of 200 mg/kg [Figure 2]. Alloxan is known for its selective pancreatic islet β-cell cytotoxicity and has been extensively used to induce DM in animals. Alloxan, in the presence of intracellular thiols, generates reactive oxygen species (ROS) in a cyclic reaction with its reduction product, dialuric acid. The beta cell toxic action of alloxan is initiated by free radicals formed in this redox reaction. One study suggests that the alloxan does not cause diabetes in humans. In our present study, it was observed that METD can reverse the metabolic derangements occurring in alloxan-induced diabetes in rats. To gain an understanding of the mechanism(s) by which METD elicits its hypoglycemic activity, various biochemical parameters were evaluated following sub-chronic (21 days) treatment in rats. Our experimental findings suggest a significant reduction in (i) blood glucose levels on different days, (ii) HbA1c levels and its HbA1c fraction and (iii) serum cholesterol and TG levels, in both METD and glibenclamide-treated rats. Alterations in antioxidant markers such as catalase, SOD, lipid peroxidase, and glutathione peroxidase were also rectified by the extract. The increased level of HbA1c is directly proportional to the decreased level of total hemoglobin in diabetic control experimental rats. HbA1c is used as the most reliable marker and the standard diagnosis parameter for estimating the degree of protein glycation in DM. On oral administration, METD significantly decreased the HbA1c level possibly due to normoglycemic control mechanisms in experimental rats which also reflect the decreased protein glycation condensation reactions. , Hypercholesterolemia and hypertriglyceridemia have been reported to occur in alloxan diabetic rats. The marked hyperlipidemia that characterizes the diabetic state may, therefore, be regarded as a consequence of the uninhibited actions of lipolytic hormones on the fat depots. Our experimental findings showed a decrease in the cholesterol and TG level in the METD treated groups. It can be concluded that this effect of T. divaricata will prove useful in hyperlipidemia associated with diabetes. Tabernamontana divaricata shows significant anti-diabetic activity and also an alleviating effect the oxidative damage similar to that of the standard drug glibenclamide in rats. From the data obtained it may be stated primarily that the plant may contain some biomolecule(s) that may sensitize the insulin receptor or stimulate the β stem cells of Islets of Langerhans in pancreas in alloxan-induced diabetic rats. Reports of earlier studies suggested that the natural antioxidant constituents such as tannins, flavonoids, phenolic acids, polyphenols  etc., enhance the free radical scavenging activity by correcting the altered biological antioxidant enzyme systems. This may beneficial for the treatment of diabetes and its related complications. The flavonoid content present in T. divaricata may be the active constituent of plant which possess antioxidant , and anti-diabetic properties. However, further comprehensive chemical and pharmacological studies are required to find out the exact mechanism and to isolate and characterize the phytoconstituent (s) responsible for the above activities. Thanks to Mr. V. Sivanadanam., for authentication of plant material and all my friends who helped me for the research work. Laakso M. Cardiovascular disease in type 2 diabetes: Challenge for treatment and prevention. J Intern Med 2001;249:225-35. Quinn L. Type 2 diabetes: Epidemiology, pathophysiology and diagnosis. Nurs Clin North Am 2001;36:175-92. Oranje WA, Wolffenbuttel BH. Lipid peroxidation and atherosclerosis in type II diabetes. J Lab Clin Med 1999;134:19-32. Habif S, Turgan N, Mutaf I, Aytaclar F, Hamulu F, Bayindir O. Plasma catalase, glutathione peroxidase and selenium levels in adult diabetic patients. Turk J Med Sci 1997;27:139-41. Nourooz-Zadeh J, Rahimi A, Tajaddini-Sarmadi J, Tritschler H, Rosen P, Halliwell B, et al. Relationships between plasma measures of oxidative stress and metabolic control in NIDDM. Diabetologia 1997;40:647-53. Garg MC, Singh KP, Bansal DD. Effect of vitamin E supplementation on antioxidant status of diabetic rats. Med Sci Res 1996;24:325-6. Salah N, Miller NJ, Paganga G, Tijburg L, Bolwell GP, Rice-Evans C. Polyphenolic flavanols as scavengers of aqueous phase radicals and as chain-breaking antioxidants. Arch Biochem Biophys 1995;322:339-46. Feillet-Coudray C, Rock E, Coudray C, Grzelkowska K, Azais-Braesco V, Dardevet D, et al. Lipid peroxidation and antioxidant status in experimental diabetes. Clin Chim Acta 1999;284:31-43. Bopanna KN, Rathod SP. Antidiabetic and antihyperlipaemic effects of neem seed kernel powder on alloxon diabetic rabbits. Indian J Pharmacol 1997;29:162-7. Leeuwenberg AJ. A Revision of Tabernaemontana. The Old World Species. Part I, Royal Botanic Garden. UK: Kew: whitstabee Litho Ltd.; 1991. Kirtikar KR, Basu BD. Indian Medicinal Plants. 7 th ed. Delhi: M/S Periodicak Experts; 1987. p. 2176. Van Beek TA, Verpoorte R, Svendsen AB, Leeuwenberg AJ, Bisset NG. Tabernaemontana L. (Apocynaceae): A review of its taxonomy, phytochemistry, ethnobotany and pharmacology. J Ethnopharmacol 1984;10:1-156. Stevens LH, Blom TJ, Verpoorte R. Subcellular localization of Tabernaemontana roseus and Tabernaemontana divaricata. Plant Cell Rep 1993;12:573-6. Khandelwal KR. Practical Pharmacognosy Technoques and Experiments. 9 th ed. Pune: Nirali Prakashan; 2002. p. 121. Harborne JB. Phytochemical Methods. 3 rd ed. London: Chapman and Hall; 1998. p. 60-1. Farnsworth NR. Biological and phytochemical screening of plants. J Pharm Sci 1966;55:225-76. Fernandes NP, Lagishetty CV, Panda VS, Naik SR. An experimental evaluation of the antidiabetic and antilipidemic properties of a standardized Momordica charantia fruit extract. BMC Complement Altern Med 2007;7:29. Amarnath Satheesh M, Pari L. Effect of Red Hogweed (Boegaria diffusa. L) on plasma antioxidants in alloxan induced diabetes. J Herbs Spices Med Plants 2004;10:113-9.
kumar N, Ponnusamy P, Appachi M, Singaravel S, Rasilingam D, Deivasigamani K, et al. Anti diabetic activity of methanol leaf extract of Costus Pictus D. Don in alloxan induced diabetic rat. J Health Sci 2007;53:655-3. Ananthi J, Prakasam A, Pugalendi KV. Antihyperglycemic activity of Eclipta alba leaf on alloxan-induced diabetic rats. Yale J Biol Med 2003;76:97-102. Dharmeshkumar D, Prajapati NM, Patel RV, Savadi KS, Mruthunjaya AK. Alleviation of alloxan-induced diabetes and its complications in rats by Actinodaphne hookeri leaf extract. Banglad J Pharmacol 2008;3:102-6. Punitha IS, Shirwaikar A, Shirwaikar A. Antidiabetic activity of benzyl tetra isoquinoline alkaloid berberine in streptozotocin-nicotinamide induced type 2 diabetic rats. Diabetol Croat 2005;34:117-28. Velázquez E, Winocour PH, Kesteven P, Alberti KG, Laker MF. Relation of lipid peroxides to macrovascular disease in type 2 diabetes. Diabet Med 1991;8:752-8. El-Missiry MA, Othman AI, Amer MA. L-Arginine ameliorates oxidative stress in alloxan-induced experimental diabetes mellitus. J Appl Toxicol 2004;24:93-7. Luck H. Catalase. In: Bergmeyer HU, editor. Methods in Enzymatic Analysis. New York: Academic Press; 1965. p. 885-94. Goldstein DE, Little RR, Wiedmeyer HM, England JD, Rohlfing CL, Wilke AL. Is glycohemoglobin testing useful in diabetes mellitus? Lessons from the diabetes control and complications trial. Clin Chem 1994;40:1637-40. Umamaheswari M, Chatterjee TK. Effect of the fractions of Coccinia grandis on ethanol-induced cerebral oxidative stress in rats. Pharmacognosy Res 2009;1:25-34. Pushparaj P, Tan CH, Tan BK. Effects of Averrhoa bilimbi leaf extract on blood glucose and lipids in streptozotocin-diabetic rats. J Ethnopharmacol 2000;72:69-76. Hardman JG, Limberd LE. Insulin, oral hypoglycemic agents and the pharmacology of the endocrine pancreas. In: Goodman and Gilman's: The Pharmacological Basis of Therapeutics. 10 th ed. USA: Mcgraw-Hill Company Limited; 2001. p. 1383-99. Rojas A, Morales MA. Advanced glycation and endothelial functions: A link towards vascular complications in diabetes. Life Sci 2004;76:715-30. Prince PS, Menon VP, Pari L. Hypoglycaemic activity of Syzigium cumini seeds: Effect on lipid peroxidation in alloxan diabetic rats. J Ethnopharmacol 1998;61:1-7. Metz SA. Is phospholipase A2 a "glucose sensor" responsible for the phasic pattern of insulin release? Prostaglandins 1984;27:147-58. Hesham RE, Shaeru N. Chemistry of bioflavonoids. Indian J Pharm Educ 2002;36:191-4. Yaryura-Tobias JA, Pinto A, Neziroglu F. Anorexia nervosa, diabetes mellitus, brain atrophy, and fatty liver. Int J Eat Disord 2001;30:350-3.